Project Fellow, Database Operator, Project Assistant, Project Biologist, Conservation Officer and Project Manager purely on a contract basis initially for a period of one year from the date of appointment of candidates. Candidates can submit their WII Application forms Online by 12th march, 2017. Selection of Project Scientist, Project Associate, NMCG Project Fellow, NMCG Database Operator, NMCG Project Biologist Jobs will be through Online written exam followed by personal interview. 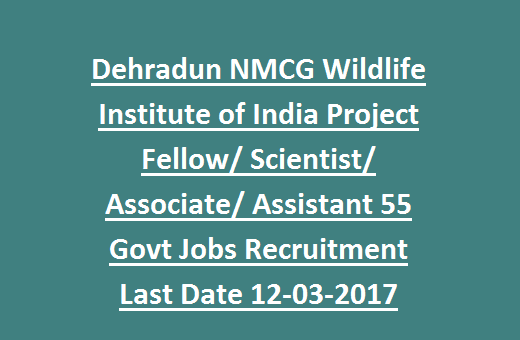 Selection of Project Assistant, NMCG Project Manager, NMCG Conservation Officer Jobs will be through personal interview only, there is no written exam. All details of NMCG WII Project Fellow, Project Scientist, Project Associate, Project Assistant 55 Govt Jobs Recruitment mentioned below. 1. Candidates can submit their WII Application forms Online by 12th march, 2017. 2. The WII Online written exam will be conducted on 26th March, 2017. 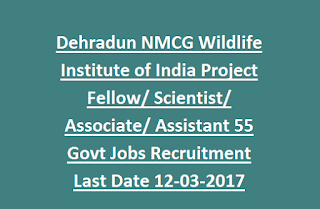 As per Recruitment of NMCG Wildlife Institute of India (WII), total Available Vacancies are 55. Candidates age limit must not exceed 45 years for Project Scientist Jobs; 40 years for Project Associate Jobs; 30 years for Project Assistant Jobs; 65 years for Project Manager, Conservation Officer Jobs; 35 years for Project Fellow and other Jobs. 1. For NMCG Project Scientist Jobs, Educational Qualification must be Ph.D. in Wildlife Science or Forestry or Environmental Science or Environmental Management or Botany or Zoology or Veterinary Science or Life Science. 2. For NMCG Project Associate, NMCG Project Fellow Jobs Qualification must be masters degree in Wildlife Science or Forestry or Environmental Science or Environmental Management or Botany or Zoology or Veterinary Science or Life Science. 3. Bachelors degree is the Qualification for NMCG Project Assistant Jobs. Please go through Official Notification for remaining Jobs. Rs.56000/- per month for WII Project Scientist, WII Conservation Officer Jobs; For WII Project Associate Rs.45200/- per month; For WII Project Assistant Rs.20000/-; For WII Project Manager Rs.42000/- per month; Rs.32000/- for remaining Jobs. 1. Selection of NMCG Project Scientist, NMCG Project Associate, NMCG Project Fellow, NMCG Database Operator, NMCG Project Biologist Jobs will be through Online written exam followed by personal interview. 2. Selection of WII Project Assistant, WII Project Manager, WII Conservation Officer Jobs will be through personal interview only, there is no written exam. 1. WII Written exam consists of 50 objective type questions of 1 mark each. 2. WII Time duration is one hour. 3. 25 questions related to Wildlife ecology and Management. 4. There is a negative marking of 0.25 marks for each wrong answer. 6. Short listed candidates will be called for interview round at NMCG WII, Dehra dun. 7. No TA/ DA will be paid to the candidates for attending WII written exam or interview. Interested candidates may visit WII Official Website of http://www.wii.gov.in/ and apply online. Candidates can submit their WII Application forms Online by 12th march, 2017.